In order to maintain our position as a leader in the plastic carrying cases industry and one of the only "truly" single source suppliers, we are required to provide the following services (all in-house): Molding of Cases (standard sizes and custom), Molding of Custom Interiors, Complete Extrusion Fabrication, Full Time Pattern and Mold Maker for control of our Tooling Program, complete Foam Fabrication Department, CAD Department for case and insert design, Specially tooled Case Hardware, and final manufacturing Assembly facilities assuring you of the best workmanship at the lowest possible cost. The cornerstone of our company is our Quality program which involves ALL of our employees ALL of the time. This has enabled us to receive "A" ratings and 100% Quality and delivery performance levels with ALL of our MRP and JIT accounts. We take tremendous pride in our environmental status made possible by large capital investment and the concern of our employees. ALL major components used in the manufacture of our cases are recycled back into our cases which enable our customers to actualize their commitment to using recycled products. There are no "CFC's" used in the manufacture of any Princeton Molded Cases or Foam Interiors. In addition, all Princeton Cases are manufactured with pride in the U.S.A. Phone today with your case requirements and put the Princeton Case advantage to work for you! Technical Design Assistance is our speciality and always without charge. We welcome the opportunity to review your current case packaging and provide you with our evaluation, recommendations, and pricing. Call our tech sales Department today to discuss your project. Our technical staff will put their expertise to work for you in designing your case packaging. The weight of your products will determine the thickness and type of plastic to be molded. In similar fashion, the type of aluminum extrusions and case hardware selections will be decided based on your needs. Our in-house foam fabrication includes slitting, die-cutting, contour cutting, convoluting, cubing, and laminating; therefore, we are correctly positioned to recommend the proper type of foam and the best method of construction for your shock absorbing interior case inserts. For inside length & width dimensions, subtract 5/8" and for inside lid dimension subtract 1/4". All cases are available in a minimum depth of about 3" in any increment to the maximum depth listed. 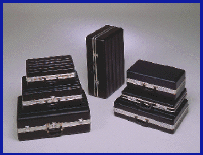 Plastic carrying cases are used for a variety of industries including manufacturing, construction, media and design, education, and health. That is why it is so important to get to know and understand how your company and/or industry will use a carrying case before deciding upon which model(s) would best suit your needs. A plastic carrying case can be incredibly versatile. Plastic blow molded cases can last longer than their metal counterparts because they will not corrode. Are Metal or Plastic Cases Better? Plastic has a tendency to not feel heat and cold the way metal does. Plastic carrying cases are cheaper, and they are also able to customized rather easily.